My father’s ancestors were peasant farmers in one of the poorest corners of Europe. But they left me a something priceless that I can pass on to my children – it’s a really good story. It goes like this: Early in the last century, my grandfather Milé Kesić was a municipal administrator in Bosonsko Grahovo, a town in the mountains of northwest Bosnia, which had recently become part of the Austro-Hungarian Empire after centuries of control by the Ottoman Turks. In that capacity, he signed some paperwork for a teenager that he knew from the next village, giving him permission to attend school in Belgrade, the capital of independent Serbia. On June 28, 1914, that same kid, Gavrilo Princip, was back in Bosnia, armed with a Browning 9mm handgun and positioned near the Latin Bridge in Sarajevo, waiting for the motorcade of Archduke Franz Ferdinand, heir to the Hapsburg throne. When the duke’s open car stopped right in front of him, Princip fired two shots, killing Franz Ferdinand and his wife and touching off a series of events that started World War I.
Princip was immediately arrested and the only document in his pocket turned out to be a passport signed by a friendly town official named Milé Kesić. So, my grandfather was also thrown in jail and held until the conspiracy unraveled and he was cleared. You know the rest: Austria declared war on Serbia; Russia declared war on Austria; Germany came in on Austria’s side and France and England backed Russia. Four years and 10 million lives later, the old world had been burned to the ground and it was a teenager from Bosnia that lit the spark. That’s the story. And it was told to me many times by people who heard it right from the source. Sadly, they’re all gone now. I met Milé when I was a little kid and he was quite old. We didn’t speak the same language, but he had a nicely round bald head and an indulgent grin. He let me wear his big felt hat, which, put him in the top tier of grownups for me. But I have his story, and it connects me to him and to the generations of our family who are otherwise missing from history. It’s a story that tells me where I come from and how I got here. It lights up the past and, maybe, gives a little hint of what’s ahead. My people might be missing from history, but Princip is not. The official record confirms that he was from Oblaj, the next village over from Kesići, where my family is from. And the descriptions you can read of Princip’s background are probably also true for my grandfather, who was only three years older. I may not have the story down 100 percent. The last person I know of who heard it straight from Milé’s mouth, my uncle Drago, died this month, closing a door to the past. When cleaning out his apartment in Las Vegas, we got another glimpse. 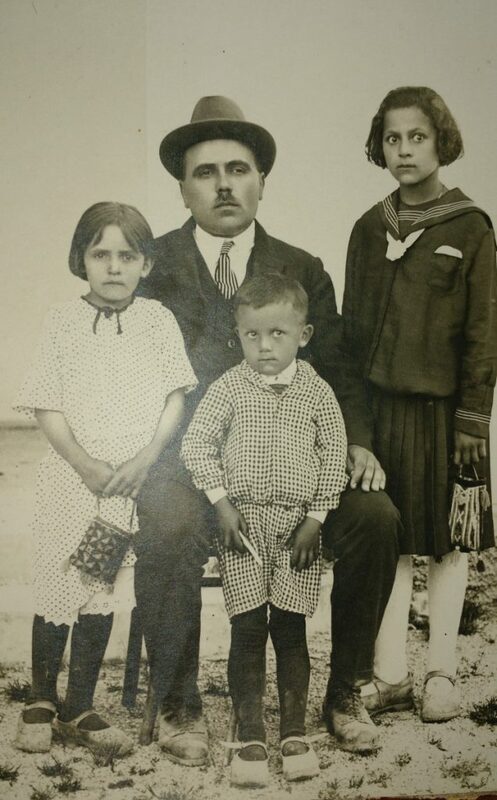 It’s a photo taken in 1924 or so, and it shows a young father with two girls and a boy. They are wearing their Sunday best, but their beat up shoes show that they had no easy life. It’s a scene out of history, as disconnected from our lives today as a steam locomotive. But the father’s round head and felt hat are strangely familiar. It’s Milé. The girls are my aunts Mirka and Zora. And the little boy is my own father, Veselin Kesich, who picked up an “h” on his name when he got to America. The 20th century was a series of catastrophes in that part of the world that set the course of each of their lives, but they couldn’t know that then. They were frozen for instant with a flash and a click, and then history went back to work on them. How far back does memory go? Only as far as our stories will take us. How far ahead can we see? Never as far as we think.